It is a striking woodpecker with its flashy red head and neck, bright white belly and black-white-black wings. When in flight that red, black, and white look so bold and brilliant against the landscape. What a beautiful bird that Red-headed Woodpecker is. When someone who I know really doesn’t know a lot about birds comes up to me and tells me that they have seen a Red-headed Woodpecker, I immediately ask them to describe it to me. The reason being is because some people mistake the Red-bellied Woodpecker for the Red-headed. Both birds have red heads but if you see the two together they are clearly two different birds for sure. 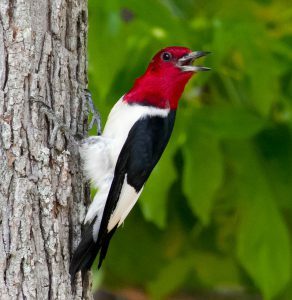 The Red-headed Woodpecker is found in Southern Canada and in the eastern central part of the United States. You will find this woodpecker particularly in beech or oak forests, in open woodland especially with areas of dead or decaying trees, around farmland, and orchards and parks. I usually see them over at the arboretum (area devoted to specimen plantings of trees and shrubs) where I walk every day. There has been a family of four living there that I look for high up in a beech tree along the walking path. This is mostly in summer but I have seen them this winter too. Every spring and summer I also look for them in my backyard in Kentucky as this is the only time I get lucky enough to get them at my feeders. In southwest Ohio when I lived on six and a half wooded acres I had absolutely none. You could only find this woodpecker at a specific location about ten miles away. There may have been other places to see this bird but it is just not as prevalent as other resident woodpeckers such as the Red-bellied that I mentioned earlier. 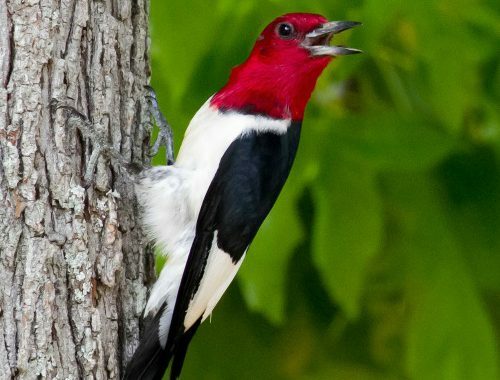 One good reason experts say is because the Red-headed Woodpecker has been declining in numbers over the years and they say it is due to loss of habitat and changes in food supply. Let’s just hope this trend does not continue. This woodpecker eats insects such as beetles, cicadas, and grasshoppers. They also eat spiders, earthworms, fruit, acorns, sunflower seeds, pine seeds, sap, and berries. Sometimes they raid other nests to eat eggs and nestlings and they also will eat mice. You may be able to lure them into your yard during the winter months with a suet feeder. Most woodpeckers are attracted to this high energy treat that contains fat and wild bird seed. They do not drill holes in trees to get insects to eat. Rather they catch them in mid air or as they are foraging along the ground. Red-headed Woodpeckers are monogamous, staying with their mate for several years. It is a highly territorial woodpecker and can get pretty aggressive with other birds as they defend their nests and food storage areas. They are solitary birds only staying with their mate during breeding season. It is a medium sized woodpecker that is 7 – 9 inches in length with a wingspan of 14 – 17 inches. It likes to store its food in the wood of trees or in fallen logs. Their predators are snakes, foxes, raccoons, flying squirrels, Cooper’s Hawks, Peregrine Falcons, and Eastern Screech-Owls. It is considered omnivorous as it eats both of plant and animal origins. That striking woodpecker with its flashy red head and neck, its bright white belly and black and white wings is the Red-headed Woodpecker. You cannot mistake him as those bold red, black, and white colors definitely stand out whether flying or just perched on a limb. You may see one in your neck of the woods especially if you have beech or oak trees or if you live around farmland just to name a few. I am usually guaranteed to see them at the nearby arboretum where I walk everyday. Plus in the spring I am fortunate to attract one or two to my feeders for a few weeks. Never have been lucky to keep it much longer though and that may be because it is able to find some good insects to eat as summer arrives. 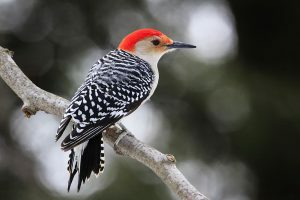 The insects that I am talking about are grasshoppers, beetles and cicadas, but Red-headed Woodpeckers will also eat spiders, acorns, fruit, sunflower seed, mice, and the eggs from a newly built nest. 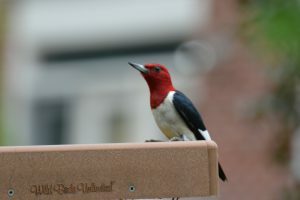 The Red-headed Woodpecker can be found in southern Canada and in the east central part of the United States. If you are lucky enough to live in these parts you may get to see one. If you have a resident in your area I would love to hear from you. Please feel free to make a comment below. Posted in Backyard Birds, Woodpeckers.